"you are all stars, you just have to initiate that fusion!" 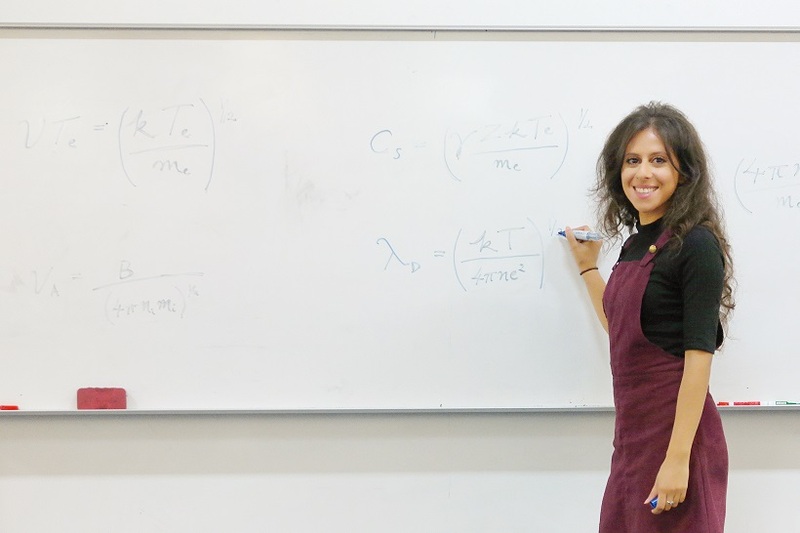 This week's #mathematicalmodel is Meriame Berboucha, who explains the role that mathematics has on her work as a physicist. Meriame is an MSci Physics student at Imperial College London. She is a Very Early Career Physics Communicator Award finalist of 2014 and was awarded the Highly Commended in Senior Science and Maths title in the National Science and Engineering Competition in 2013 which was held at the Big Bang Fair in the ExCeL Centre, London. She has a passion for science communication and set up her own Science Club at her old school with an aim to get more girls interested in STEM. She is also a keen blogger, author of numerous articles including Catalyst Magazine and Forbes and has recently become a young advisor for the Young Scientists Journal, young fusion writer for EUROFusion and producer of Science Mixtape on Soho Radio. Her blog can be found here, where she explains what it's like to be 'a girl in a physics world' and hopes to inspire others to beat the stereotypes. I’m an MRes Photonics student at Imperial College London who will be completing a research project at SLAC National Accelerator Laboratory this year. My field of research lies in plasma and laser physics, and I’m just about to start my MRes so I don’t currently know what my project will be but it will be laser based and I love lasers so I can’t wait to start! Previously though, I’ve carried out projects relating to recreating the conditions of space in the lab, and accelerating particles with a laser in a plasma (ionised gas) which can be used for imaging. So with laser and plasma physics we can learn more about the universe we live in but also help medicine too – which I think is awesome! Physics is essentially applied mathematics. Physicists explain how our universe works in terms of equations and we can deduce things about our world with these equations. I LOVE how mathematics can simplify something as simple as moving objects using an equation. For instance, Newton’s second law of motion which states that the force applied on an object is proportional to the acceleration of that object – basically the harder you pull/push an object the faster it’s going to move and you can just state this with one simple equation: F = ma (F = force, m = mass, a = acceleration). So for me, mathematics is vital for the physics that I do and plays a huge role in my everyday physicist life. I’ve got to say one of my favourite parts of using maths in the physics that I do is graphs. It’s such a visual way to present data and you can instantly tell the trend between two variables. Also, I just love making things look nice (my inner artist coming out here) so I do love a bit of graph making. At school I took maths up to A Level and at A Level I took maths and mechanics modules. So I took the standard maths courses like integration and differentiation and then mechanics was all about applying maths to real life scenarios like a skier riding down a slope or throwing a ball in the air. For me, mechanics was my favourite thing about maths A Level – I loved being able to calculate the answers to real life scenarios, hence the reason why I love physics! The hardest thing I had to go through at school though, was being the only girl in my physics class and feeling like I wasn’t clever enough to be there. I felt like all the guys in the class were cleverer than I was but luckily, I had a really nice physics teacher who made sure I answered questions in class and felt like a part of the team. Soon enough, I started to gain confidence in the class and I ended up really loving being there. A school trip to the Rutherford Appleton Laboratory converted me into a physics lover because for the first time I saw the connection between medicine and physics. I have always wanted to be a medical doctor up until that point, but I really loved maths and physics so then when I found out about that I could do both in the field of medical physics it totally changed my view on physics. I could save lives with physics, how cool?! Even though in my mind, physics was the subject for me I still got comments from my friends like ‘why are you doing physics, you’re clever you should do medicine’. Comments like these made me doubt my career path, but I stuck to what I loved and now I’m about to graduate with a physics degree and I loved every moment of it! With the skills you learn from science and maths, such as problem solving, and analytical skills, you’ll be candy to employers and can pretty much have any career you want! So, it’s so important that these are taught well at school in a way where it’s approachable by all. So I think maths and science education is really important. On top of that, science communication in my eyes plays quite a significant role in getting the younger generation inspired into considering a career in STEM. I hope by sharing my story I can allow other girls who like male-dominated subjects like physics to follow their dreams and realise that physics is not a guy subject and that girls can do it too! For more physics inspiration, follow Meriame's blog, "A Girl in a Physics World," at http://meriameberboucha.blogspot.co.uk/, and follow her on social media on Instagram and Twitter!